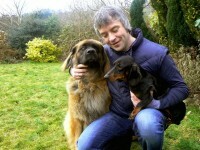 My name is Paul Barry (that’s me on the right) with one of our Standard Smooth Dachshunds Daisy, and Kyla the Leonberger who belongs to a friend and supporter of the site. Of course it’s a team effort that keeps the site on track, and all involved here have had dogs in their lives since they were knee high to grasshoppers. Our aim at pedigreedogs is to provide people interested in owning a pedigree dog the platform and opportunity to contact people in their interested breed/s, with the possible outcome of eventually becoming a life long owner. Through our regular posts on the blog, and by policing the classified section we try and eliminate some of the unfortunate risks that potential puppy owners are faced with when starting on the road to becoming a life long owner of a pedigree dog. We believe our site is cleanly laid out and user friendly. Ads must be accompanied by a photo that promotes responsible dog ownership, showing dogs of good health, and kept in suitable conditions, with no exaggerated text. Only people domiciled on the Island of Ireland can use the site. Check out the site, we would welcome your comments and feedback on same. If you have a dog related web site send us on your details and we can link your site on our Blog where breed clubs and show kennels are listed along with some useful links. Finally, if you haven’t found what you are looking for, head on over to the contact us tab and fire us off an email, we’d only be to happy to try and put you in touch with somebody in your interested breed that like us, believes in doing things the right way.